Production is currently underway in Dublin on the set of ‘Earthbound’, the debut feature by writer-director Alan Brennan (Shapes). The RomCom Sci-Fi from Ripple World Pictures and Paper Dreams stars Rafe Spall (Hot Fuzz, Shaun of the Dead) Jenn Murray (Dorothy Mills) and David Morrissey (Centurion, Nowhere Boy). The feature sees Rafe Spall play Joe Norman, a normal guy who is told by his father Bill (David Morrissey) that he is an alien and must continue his dying species to save his home planet. 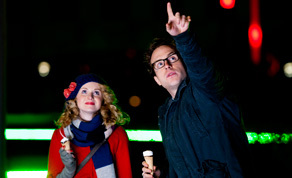 Joe finds and falls in love with human Maria, played by Jenn Murray. As alien intergalactic bounty hunters begin their pursuit Joe must keep Maria safe before it’s too late. Heidi Madsen (Shapes) of Paper Dreams is producing the feature with Dominic Wright (Retreat) and Jacqueline Kerrin (Parked) of Ripple World Pictures executive producing. The film’s cinematographer is P.J. Dillon (The Runway, Kings) and the production designer on board is David Wilson (Shrooms, Eat the Peach). The feature will shoot in Dublin for four weeks. The team in Ripple World Pictures enjoyed recent success with their previous co-production ‘Lapland Odyssey’ which went to number one in Finland on the day of its release last month, beating ‘Despicable Me’ and setting a new record for a domestic film. This week the rom-com road move has moved to second position behind ‘Harry Potter and the Deathly Hallows: Part 1’ but ahead of blockbusters such as ‘Due Date’, ‘The Social Network’ and ‘RED’ at the Finnish box office. Released on 81 screens and with over 46,000 tickets sold, Finnish director Dome Karukoski's fourth feature film had the strongest opening for a local film in 2010 and the fifth biggest opening for a local Finnish film in the last decade. France’s DistriB Films acquired distribution rights to ‘Lapland Odyssey’ following the film’s world premiere at the Toronto Film Festival in September 2010.